Springbrook is a mountain and plateau in the Gold Coast hinterland of South East Queensland, Australia. It is also the name of the associated town and locality within the City of Gold Coast. The highest point, known as Springbrook Mountain is 990 metres (3,250 ft) high. The plateau is covered in subtropical rainforest and crossed by many small creeks. The area has excellent views to the Gold Coast and is known for its cliffs, waterfalls and forest walks, most of which are protected in the Springbrook National Park. Road access to this eastern Scenic Rim mountain is via Mudgeeraba along the Springbrook Road and from Numinbah Valley via Pine Creek Road. 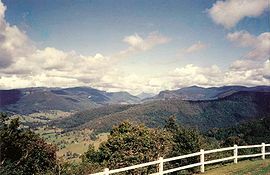 To the south of Springbrook is the Tweed Range, west is the Numinbah Valley and the Lamington Plateau. Both the Nimmel Range and Tamborine Mountain are to the north, as is Hinze Dam while the peak of Mount Nimmel is at the north eastern tip. The plateau is part of a biodiversity hot spot. It is part of the Scenic Rim Important Birdlife Area. Pademelons are commonly seen by visitors. Springbrook Plateau is the remains of the Tweed Volcano—now known as Mount Warning. The plateau is an undulating elevated patch that extends north from the southern, forested heights, close to Mount Cougal, just to the east. These subtropical rainforests are part of the Gondwana Rainforests of Australia and contain the rare Antarctic beech trees. Springbrook plateau has been described as "the Switzerland of Queensland" and a unique wonder. Springbrook was widely considered to be part of the McPherson Range. As the area's geology was understood it has now come to be typically described as a distinct plateau landform. Notable lookouts on the plateau include Best of All Lookout, overlooking the Tweed Valley directly south of Springbrook, as well as Canyon, Goomoolahra and Purlingbrook lookouts. Springbrook features the Purlingbrook Falls, which is a major tourist attraction as well as Goomoolahra Falls. The plateau is highly visible on the western horizon from the Gold Coast coastal strip. Springbrook Plateau is in the water catchment area for Tallebudgera Creek and the larger Nerang River dammed by the Hinze Dam, a significant part of the region's water supply infrastructure. Little Nerang Creek flows into Little Nerang Dam in the north of the locality. The Natural Bridge is a rock arch and waterfall on the western slopes of the plateau. A triangulation station is located close to Mount Thillinmam at Bilbrough Lookout. Mobile reception is generally poor at Springbrook. Beginning in 2005 the Beattie Government and Bligh Government spent $40.15 million purchasing 45 properties covering 705 hectares in Springbrook. The aim is to restore critical habitat to world heritage status and eventually expand the Springbrook National Park. The recovery process is conducted by the Australian Rainforest Conservation Society and led by Aila Keto. The land purchases have been criticised because of a lack of accountability, for pushing up land values and negatively affecting tourism by reducing the number of accommodation places, restaurants and cafes. Springbrook was the site for a trial that involved 200 distributed, wireless sensors that can monitor natural conditions such as humidity, temperature, light, rainfall, fog, water quality and sound. The cutting edge technology was developed by the CSIRO to assist research into the restoration of natural vegetation. Bush camping is not permitted in the national park. There is one camping area in Carricks Road. Springbrook is the eastern end of the Gold Coast Hinterland Great Walk. This mountain hike links to O'Reilly's Rainforest Retreat via Binna Burra. Due to its close proximity to the coast, the high elevations and subtropical latitude, Springbrook has a wet climate with mild temperatures. 900 mm of rainfall was recorded in a 24-hour period before an unnamed cyclone crossed the coast at Coolangatta on 20 February 1954. During a remarkable rainy period, Springbrook received 1,631 millimetres (64.2 in) in the month of June 1967. In January 2013, 1,453 millimetres (57.2 in) of rain fell over a period of just 4 days, due to the remnants of Tropical Cyclone Oswald. In March 2017, 1,407 millimetres (55.4 in) of rain fell  in part due to Cyclone Debbie, 789 millimetres (31.1 in) of which was recorded at Upper Springbrook on the 31st of March 2017, causing enough damage to cut off the two access routes into Springbrook and leaving many residents without electricity. The timbered plateau was settled relatively late with both the area's inaccessibility and timber reserve status acting as deterrents. In 1906, the area ceased to be a timber reserve and was opened for agricultural settlement. In the same year the first group of settlers, including James Hardy, arrived from northern New South Wales and referred to the new settlement as Springwood. Following the request of postal officials to change the name to avoid confusion with another location in New South Wales, the area became known as Springbrook. Dairying was encouraged but the settlers found farming difficult and instead cleared for the land for timber. By the 1930s Springbrook was almost completely cleared of trees. In 1911, a school opened and by 1947 a community hall had been built. Tourism has been the major industry since the 1920s, with many guesthouses opening during this period. A decent road up the mountain was built in the mid 1920s with the first car reaching the settlement in June 1926. The first declaration of a national park on the plateau was Warrie National Park in 1937. The post office was closed in 1958. A memorial to the pioneering settlers of the area was built in 1961 to celebrate 50 years since opening of the former Springbrook State School. Springbrook was originally known as the Numinbah Plateau. Springwood was the first name chosen for the locality, however it was changed to Springbrook to avoid confusion with mail deliveries to another Springwood located in the Blue Mountains. The Springbrook Mudgeeraba branch of the Queensland Country Women's Association meets at the Bill Deacon Pavilion, Mudgeeraba Showgrounds at 115 Mudgeeraba Road, Worongary. ^ a b c d Queensland Environmental Protection Agency (2000). Heritage Trails of the Great South East. State of Queensland. p. 26. ISBN 0-7345-1008-X. ^ "Springbrook Mountain (entry 31987)". Queensland Place Names. Queensland Government. Retrieved 20 January 2015. ^ "Springbrook - town (entry 31986)". Queensland Place Names. Queensland Government. Retrieved 20 January 2016. ^ "Springbrook - locality (entry 46087)". Queensland Place Names. Queensland Government. Retrieved 20 January 2016. ^ "Scenic Rim". Sites – Important Bird and Biodiversity Areas (IBAs). Birdlife International. Retrieved 30 January 2016. ^ a b Springbrook National Park: Visitor Information. Queensland National Parks and Wildlife Service. 1994. ^ a b "SPRINGBROOK". The Central Queensland Herald. Rockhampton, Qld. 19 February 1931. p. 27. Retrieved 30 January 2016 – via National Library of Australia. ^ Seeing South-East Queensland (2 ed.). RACQ. 1980. p. 46. ISBN 0-909518-07-6. ^ "Springbrook National Park: FAQ". Department of National Parks, Sport and Racing. 18 December 2015. Retrieved 20 January 2016. ^ Kate Dennehy (21 June 2009). "'Secretive deals' threaten Springbrook". Brisbane Times. Fairfax Media. Retrieved 20 January 2016. ^ a b "Springbrook National Park: Camping information". Department of National Parks, Sport and Racing. 18 December 2015. Retrieved 30 January 2016. ^ "Gold Coast Hinterland Great: Walk map" (PDF). Queensland Government. Retrieved 30 January 2016. ^ Damien Larkins (20 February 2014). "The Great Gold Coast Cyclone - February 1954". ABC News. Australian Broadcasting Corporation. Retrieved 19 January 2016. ^ "The Winter storms of June 1967". Bureau of Meteorology. Archived from the original on 17 March 2009. Retrieved 16 December 2008. ^ "Daily Rainfall 2017 Springbrook Road". Bureau of Meteorology. Retrieved 26 April 2017. ^ "Cyclone Debbie: Evacuations in Gold Coast, Logan, Beenleigh amid record floods". Australian Broadcasting Corporation. Retrieved 26 April 2017. ^ "Springbrook history". City of Gold Coast Council. Retrieved 18 January 2016. ^ a b c "Springbrook National Park; Nature, culture and history". Department of National Parks, Sport and Racing. 18 December 2015. Retrieved 19 January 2016. ^ "SPRINGBROOK PIONEERING". Tweed Daily. XII (176). New South Wales, Australia. 29 July 1925. p. 4. Retrieved 4 June 2016 – via National Library of Australia. ^ "CLOSER SETTLEMENT". The Brisbane Courier. LXIV (15, 536). 28 October 1907. p. 2. Retrieved 4 June 2016 – via National Library of Australia. ^ a b "Springbrook history". Archived from the original on 16 January 2010. Retrieved 14 December 2008. ^ "OVERLAND'S ACHIEVEMENT". The Brisbane Courier (21, 344). 23 June 1926. p. 17. Retrieved 4 June 2016 – via National Library of Australia. ^ "Motors and Motorists. How the First Motor Car Climbed Springbrook Queensland's Neglected Motorist's Paradise Described". The Brisbane Courier (21, 350). 30 June 1926. p. 17. Retrieved 4 June 2016 – via National Library of Australia. ^ "Post Office Details: Springbrook". PPA. Retrieved 20 January 2016. ^ "Springbrook Pioneers Memorial". Monument Australia. Retrieved 31 January 2016. ^ "Springbrook Road and Associated Infrastructure (entry 602140)". Queensland Heritage Register. Queensland Heritage Council. Retrieved 19 June 2013. ^ "Former Springbrook State School (QPWS Information Centre) (entry 602141)". Queensland Heritage Register. Queensland Heritage Council. Retrieved 19 June 2013. Wikimedia Commons has media related to Springbrook, Queensland.